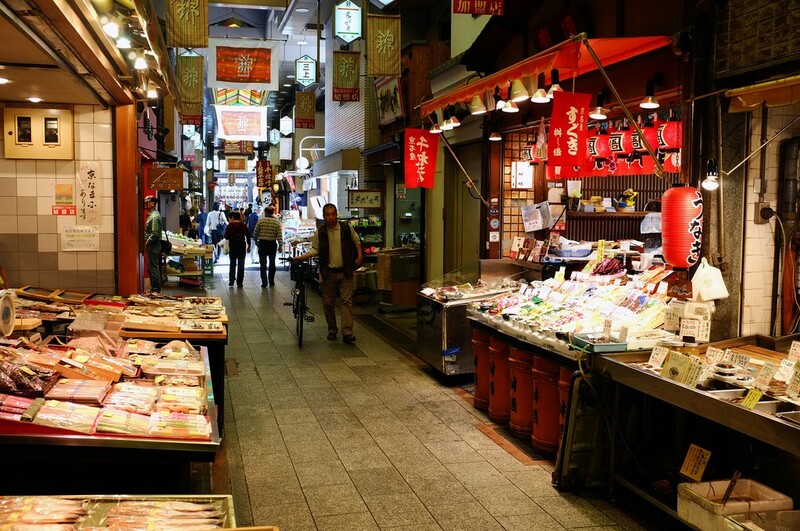 Japan is an overwhelming country, but not for the reasons you might think. There’s so much food to try at any given time. When I visited, I kept seeing street food I wanted to try. I went with the sole goal of eating a bowl of ramen in every city I visited. My boyfriend and I enjoy taking cooking classes when we’re at home so we figured, why not try one in Japan? I wanted to take a small cooking class so we could ask questions and learn more about the food and its traditions. I went into a TripAdvisor black hole until I found Taro’s Cooking Class, which has earned the number one spot for classes and workshops in Kyoto; it’s so well deserved. We arrived in Kyoto on our fourth day in Japan and used it as the main base for our trip. The next morning, we navigated the strange and mesmerizing streets of Kyoto trying to find the tiny alley in a tiny mall. Taro’s directions explained that the place had a red arch. After walking around in circles for what seemed like a few hours, we finally found Taro at the entrance of the 400-year-old Nishiki Market. My boyfriend and I had booked a market visit before our cooking class to ask questions about ingredients and talk about miso. Taro greeted us with a slight bow and introduced us to another older couple in the tour. Taro is in his early 30s and full of energy. His English is perfect because he used to live in California. He starts telling us about the history of the market and his small family, and as we wandered around the stalls, we saw bonito flakes being made, fermented fish, pickles of all different kinds and so much more. We stopped at a knife store that has been there since the market’s early beginnings, and it smells of old wood and fish sauce. It’s beautiful inside; very narrow. As Taro picked up ingredients from a vegetable stall, an elderly lady grabbed my arm and started speaking to me in Japanese. I was confused, but decided to follow her. 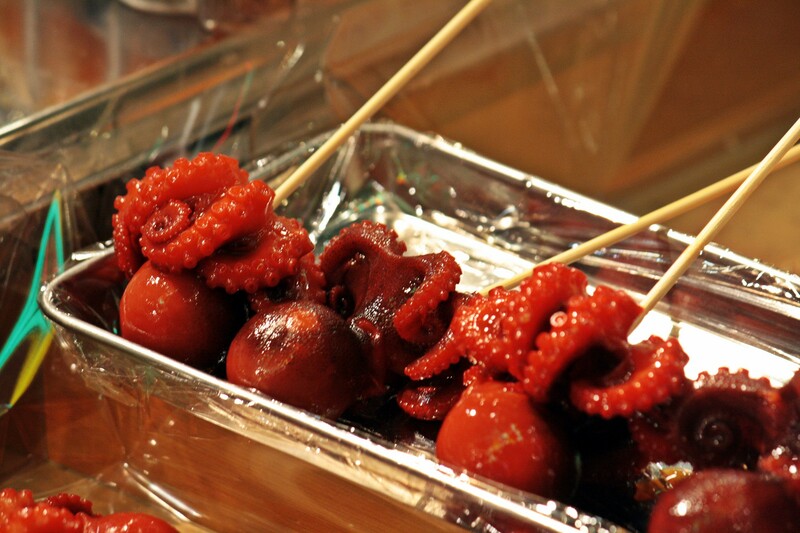 She brought me to the stall directly across from the vegetable stand and pointed to some tiny octopuses on sticks. She kept making an egg motion and then pointing to her head. Taro quickly translated for me and told me it was an octopus with a quail egg in its head. I gave her some money, grabbed a stick, screamed YOLO in my head and took a bite. It was delicious. The woman beamed. After we were done going through the market, we hopped on a bus with Taro and he showed us his neighborhood and told us about his career path. Cooking was his passion, and after a string of different jobs, he started teaching cooking classes from his house. They took off from there. He told us that he was glad that he gets to spend time with his family. We arrived at his small row house and his pregnant wife and daughter welcomed us; the daughter was dressed in a Sailor Moon outfit. There were six of us in the cooking class ready to create a full meal by the end of the experience. The dish we were looking forward to the most? Kobe beef. Taro had picked up Kobe beef from his local butcher to share with everyone. Before the cooking started, he explained the specifics of the beef certificate: The beef comes originally from Wagyu cattle, grown in a specific part of Japan. Kobe beef can only be handled by certified butchers in order to be authentic. The fat in the beef was of such high quality that it slowly started to melt at room temperature, giving it a slight glittery look. While many American restaurants offer Kobe beef, it’s not of the same caliber. We set up in Taro’s kitchen with aprons and started taking turns chopping and talking about seaweed. We learned that there’s barely any dairy in a Japanese diet so they get their calcium from seaweed. We used it in class to make dashi stock for miso soup. Dashi stock is the base for a lot of Japanese dishes, so it helps to learn how to make it from scratch. We learned how to pickle vegetables with salt and make tamago, a slightly sweet egg in the shape of a cube. After most of the meal was ready, he quickly made the Kobe beef for us (no way he would let us cook that!) and sliced it thinly. As we sat across each other on the floor at a small table, speaking different languages to our partners, I realized just how powerful food is. The couples from Sweden, Germany and elsewhere, all ended up here with us, cooking and eating this amazing meal. After six hours of hanging out with Taro and his family, we said goodbye and thanked him for his hospitality. He sent us home with a few of his cooking tools, including a special oil brush contraption that we still use in our kitchen. Now, we always add a cooking class to our trips; it’s a great way to immerse yourself in the culture while eating some top-notch food. If you are in Japan, go visit Taro. His Kyoto cooking class was my favorite part of our 12-day trip. Book it here. And, yes, I ate more bowls of ramen than I could count.